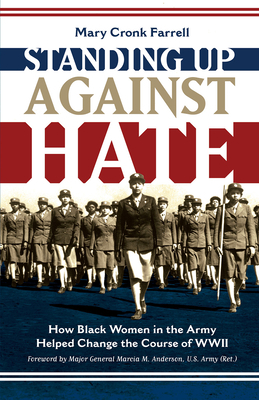 Standing Up Against Hate: How Black Women in the Army Helped Change the Course of WWII (Hardcover) | Eagle Harbor Book Co.
"The text is accessible for middle school and high school historians who are intrigued by institutional racism or women in the military for research. It profiles milestones in the 6888th’s preparation and deployment, providing a well-researched understanding of the time period for black women in the military. The book is a gem." "Farrell brings in the voices of the women, which provides clarity and understanding of what they experienced. She also highlights the role of black newspapers in keeping the community informed about the difficulties they often faced. The text is richly supported with archival photographs. The importance of this story is amplified by the inspiring foreword by Maj. Gen. Marcia M. Anderson, Army (Ret. ), who makes a direct link between the determined struggles of those described and the achievements of African American women in today's U.S. military. The stories in this valuable volume are well worth knowing." "Farrell explores the degradations suffered and resistance mounted by Black WAACs and WACs (when the corps became part of the Army) and follows the experiences of the 6888th Battalion . . . Readers familiar with Sheinkin’s Port Chicago 50 will be fascinated." "An adventurous ride through the history of black women pioneers."